Petrochemical refineries provide many opportunities for the application thermography. At the same time, they also provide unique safety challenges. In this Tip we discuss safety issues when working around hydrogen sulfide. Hydrogen sulfide is a colorless, flammable, extremely hazardous gas with a “rotten egg” smell. It occurs naturally in crude petroleum and natural gas, and can be produced by the breakdown of organic matter and human/animal wastes such as sewage. Large quantities of hydrogen sulfide are often produced in refineries. Unintended leaks can allow hydrogen sulfide to collect in low-lying and poorly ventilated areas such as basements, manholes, sewer lines and underground telephone/electrical vaults. Hydrogen sulfide can be smelled at low levels, but with continuous low level exposure or at higher concentrations you lose your ability to smell the gas even though it is still present. At high concentrations one’s ability to smell the gas can be lost instantly. NEVER depend on your sense of smell for indicating the continuing presence of this gas or for warning of hazardous concentrations. The health effects associated with exposures to hydrogen sulfide vary with how long, and at what level, you are exposed. Asthmatics may be at greater risk. At low concentrations, hydrogen sulfide can cause irritation of eyes, nose, throat, or respiratory system. At high concentrations, shock, convulsions, coma, and death are possible; in some cases the effects can occur within a few breaths. Before entering areas with possible hydrogen sulfide, the air should be tested for the presence and concentration of hydrogen sulfide by a qualified person using appropriate test equipment. Testing should also be performed to determine if fire/explosion precautions are necessary. If hydrogen sulfide or hazardous gasses are present, the space should be ventilated until acceptable limits are achieved. In some cases, continuous monitoring of the work area may be required. Thermographer safety is one of the many topics covered in the Infraspection Institute Level I Certified Infrared Thermographer® training course. For more information including course locations and dates, visit Infraspection Institute online at www.infraspection.com or call us at 609-239-4788. Tip suggested by: Peter Plein, Certified Infrared, Inc.
To help ensure proper handling of their equipment, most thermographers who travel by air opt to hand carry their imagers. Proper planning and preparation can help avoid delays when passing through security checkpoints. Lastly, be aware that contaminants from industrial environments can cause positive test results during explosives screening. Should your equipment test positive during screening, remain calm while security personnel sort things out. Since this can take some time, it is possible that you will miss your scheduled flight, particularly if you are on a tight schedule. 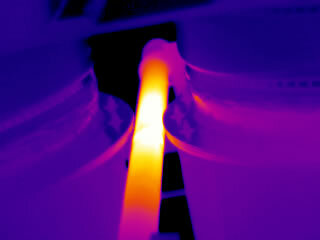 Thermal image shows left capacitor operating at ambient temperature. 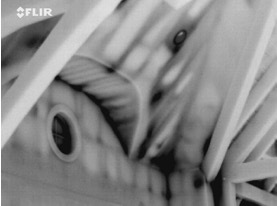 Proper conduct of an infrared inspection requires line of sight access to the object(s) being inspected. A first surface mirror can often be utilized to inspect components that may be obstructed or obscured. A first surface mirror is a special optical mirror that has a highly reflective coating adhered to the front of the mirror substrate. For infrared inspections, first surface mirrors can be temporarily utilized as reflectors to inspect areas that are inaccessible or unsafe for a thermographer to enter. First surface mirrors are commercially available from a number of scientific suppliers that deal with optics and lasers. When using a first surface mirror, be certain to follow necessary safety precautions, especially when working near energized electrical components. The use of first surface mirrors and proper inspection techniques are two of the many topics covered in all Infraspection Institute Certified Infrared Thermographer® training courses. For more information on open enrollment classes or our Distance Learning courses, call 609-239-4788 or visit us online at infraspection.com. Prior to undertaking any task or project, it is important to have a clear understanding of what the final outcome should be. With this vision in mind, one is able to gauge the effectiveness of their efforts in achieving goals. By beginning with the end in mind, one knows what the goals are and can help chart a course of action that leads directly to these goals. Designing an effective infrared inspection program is one of the many topics covered in the Infraspection Institute Level III Certified Infrared Thermographer® training course. For more information including course locations and dates, visit Infraspection Institute online at www.infraspection.com or call us at 609-239-4788. A Thermographer is like a professional photographer – both communicate a message about their subjects through imagery. Similar to photography, focus, composition, and exposure of thermograms are important since they are often the main vehicle that a Thermographer uses to convey information. Ensure that the image is in focus. High pixel count imagers are still “low resolution” compared to even the lowest cost daylight cameras. Typical infrared images may not seem very “clear” to an end user who has no experience interpreting thermograms. Capturing images which are even slightly out of focus will degrade their clarity and can compromise the accuracy of radiometric data embedded within the thermogram. Show your target as large as safely practical. Ideally, the target should fill up a significant portion of the imager’s display screen. Select an imaging distance and lens to ensure that the target is big and clear in the imager’s viewfinder. By using the maximum amount of pixels across the target, you provide the best optical and thermal resolution and minimize measurement errors due to spot size limitations. Adjust imager Level and Gain settings to provide the most dynamic range of color for the object. Adjust the imager to use most of the color on the object and limit how much color is used for the background unless it is important to also show some background information. This approach will give images the best contrast while conveying the most thermographic information to the recipient of the report. There are many philosophies of how to best thermally tune images and one may be more appropriate than another depending on the application and what the Thermographer is trying to show the end user. One approach is to treat tuning as a dynamic element, tuning for each image taken. Another is to tune all images the same so a large set of images all have the same temperature span which makes them easier to compare when viewed as a set. For instance, if a specific exception within a structure’s wall is the target, tuning the image to best show that local area of interest may be appropriate. An example of this would be to tune the image so that the details of an insulation void within a wall, or a thermal bridging element are well defined using the most amount of colors across the smallest temperature span to clearly illustrate the exception. However, if the task is to image a side of an entire building then you may choose to sacrifice some local thermal contrast to achieve a more uniform presentation down the length of a building wall by tuning all images to the same span and level. For a comprehensive report of a building you may need both globally tuned lower dynamic range images taken sequentially down the side of a building and high dynamic images of specific areas on that wall and which have been finely tuned to best show that particular exception. In electrical work, each image is typically tuned for a specific target. In this application, it is critical to finely tune the image such that it is possible to see from where heat is being generated in a group of connections or components. The job of the Thermographer is to locate exceptions and present them to the end user through report imagery. Images which are clearly focused, well-composed, and properly tuned for will convey the most information and require the least amount of explanation. Well known for its ruggedness and distinct architectural features, timber frame construction is a popular choice for commercial and residential buildings. 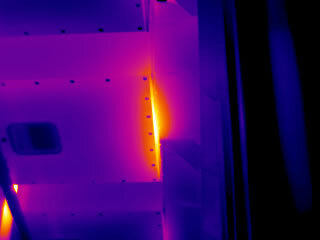 Used properly, thermal imaging can be used to detect evidence of excess energy loss within these unique structures. Timber framing is a building construction method that utilizes heavy, squared-off timbers rather than dimensional lumber such as 2x4s. Timbers are carefully fitted and secured using mortise-and-tenon joints often held together by large wooden pegs. The use of timber framing was common for wooden buildings constructed in the 19th century and earlier. When utilizing timber frame construction for conditioned buildings, particular attention must be paid to the construction of exterior walls and the roof to minimize air leakage. Failure to do so can result in significant comfort and performance issues. The dark areas in the thermal image below are the result of significant air leakage within a timber framed building. In addition to detecting air leakage sites, thermal imaging can also reveal energy loss due to missing, damaged, or misapplied insulation. 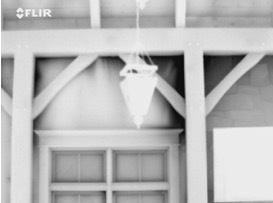 The thermal image below shows an exterior wall and roof of a timber framed building where traditional framing was used for sidewall and roof construction. The dark areas show significant energy loss. For best results, thermal imaging of timber framed buildings should be performed from the inside of the building when there is an inside/outside temperature differential of at least 10 Celsius (18 F) degrees. Thermal imaging may be performed under natural conditions or while the building is depressurized. Imaging should be scheduled to avoid errors due to solar loading of the building’s walls and roof. Infrared inspections of building envelopes is one of the many topics covered in the Level I Infraspection Institute Certified Infrared Thermographer® training course. For information on thermographer training or to obtain a copy of the Standard for Infrared Inspection of Building Envelopes, visit us online at www.infraspection.com or call us at 609-239-4788. Infrared imager selection and operation are two of the many topics covered in the Level I Infraspection Institute Certified Infrared Thermographer® training course . For information on our open enrollment or Distance Learning courses, please visit us online at www.infraspection.com or call us at 609-239-4788. With interest in renewable energy at an all-time high, photovoltaic systems have become a common sight worldwide. Infrared inspections can be used for quality assurance inspections of new installations or to monitor the performance of existing ones. Photovoltaics is a method of converting solar energy into electricity. A photovoltaic system uses an array of several solar panels each of which is comprised of several solar cells. When exposed to sunlight, the solar cells produce direct current electricity. This DC power can then be converted to AC power for local use or to supply a power grid. Defective cells or wiring within solar panels can cause hotspots that compromise the power output of the panel. Such hotspots are readily detected with a thermal imager while the panel is exposed to sunlight. 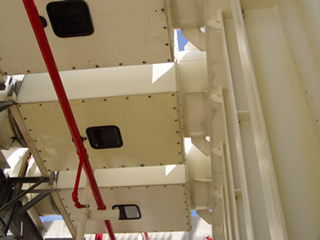 Performed from either the topside or underside of panels, infrared inspections provide the most cost effective method for detecting defects within installed panels. Thermogram shows several hot spots caused by defective cells within installed PV panels. Lastly, make certain to observe all safety precautions during the infrared inspection especially when working from an aircraft or an elevated vantage point. Personnel should also take care to avoid electrical hazards when working near exposed, energized electrical conductors. Infrared inspections of photovoltaic panels is one of the many topics covered in the Level I Infraspection Institute Certified Infrared Thermographer® training course. For information on thermographer training or to obtain a copy of the Standard for Infrared Inspection of Installed Photovoltaic Systems, visit us online at www.infraspection.com or call us at 609-239-4788. Shipping infrared equipment is a frequent necessity for thermographers. Taking the time to make certain that equipment is adequately insured can help prevent bigger problems in the event of loss or damage. Many companies insure their infrared equipment to guard against loss or damage while the equipment is in use or transit by company employees. Typically referred to as Inland Marine or Scheduled Equipment, this coverage is generally purchased in addition to the contents portion of a company’s general insurance policy. In order to be covered, equipment must be specifically identified by make, model, serial number and value. For those who find it necessary to ship equipment via a third party or common carrier, purchasing additional coverage known as ‘Goods in Transit’ may be a smart move. While many shipping companies offer options for ‘insurance’, such coverage is often quite limited and may be insufficient to properly guard against loss. In addition to providing better coverage, a Goods in Transit policy is usually less expensive than insurance offered by freight or parcel carriers. Regardless of how you insure your equipment, be certain to review your policy with your insurance professional and understand exactly what is covered. Lastly, always make certain that equipment is covered for replacement cost rather than ‘Fair Market Value’. Care and use of infrared equipment is one of the many topics covered in the Level I Infraspection Institute Certified Infrared Thermographer training course. For more information including course locations and dates, visit us online at infraspection.com. Infrared equipment selection and operation are two of the many topics covered in all Level I Infraspection Institute Certified Infrared Thermographer® training courses. Open enrollment classes are available at several locations each month and through our Distance Learning Program. For information on thermographer training including course locations and dates, visit us online at www.infraspection.com or call us at 609-239-4788. For many, it’s that time of year again when nature’s little wonders come out and remind us that we need to be proactive in reducing our exposure to the flying and crawling types of hazards. In this Tip, we offer suggestions for dealing with mosquitoes, ticks, and bees. Thermographer safety is one of the many topics covered in the Infraspection Institute Level I Certified Infrared Thermographer® training course. For more information on open enrollment classes or our Distance Learning courses, visit Infraspection Institute online at www.infraspection.com or call us at 609-239-4788. Parallel conductors are a common feature on many electrical circuits. When properly used, an infrared imager can detect evidence of serious problems that might otherwise go undetected. Insulated conductors play a vital role in electrical systems by carrying current to connected devices. Single phase circuits in receptacle and lighting panels use individual conductors to perform this function. Feeder type conductors however, are typically much larger in size and load carrying ability and quickly reach a point where it becomes impractical to install them using only one conductor per phase. In these cases, parallel conductors are used. In theory, each parallel conductor should be the same diameter and length for a specified feeder circuit in order that the carried load is shared evenly among the conductors. Properly functioning parallel conductors on the same phase should exhibit equal temperatures with no discrete hotspots. During a recent inspection at an industrial site, a 25 F degree temperature rise was observed on one of two, 400 amp rated parallel feed conductors that linked an 800 amp 3-phase breaker to the main lugs of a motor control center. An ampere reading showed that the warm conductor was carrying 450 amps while the paired conductor had less than 1 amp. showing one cable 25 F degrees warmer than its pair. 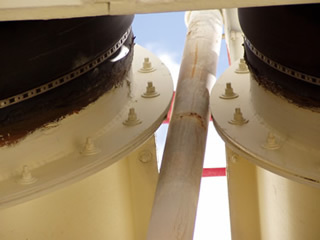 An infrared inspection at the main lug compartment of the motor control center showed the same thermal relationship as observed at the main breaker and led to the discovery of a deteriorated connection that no longer was capable of carrying load. Under normal inspection protocol at this facility, this motor control center was not scheduled for infrared inspection for another year. If not for our investigation as to the cause of the thermal anomaly at the main breaker, this overload condition would have persisted and potentially caused a catastrophic failure. at the main lug of the motor control center. When performing infrared inspections of parallel feed conductors it is important to understand that paired conductors are sharing load and therefore should have identical thermal patterns. Differing thermal patterns between paired conductors should always be investigated as overload conditions may develop on one or more conductors. Conductors operating at cooler temperatures are usually the result of broken conductors, conductors of drastically different resistance, or connections that have failed completely.